I made my background with brushos. 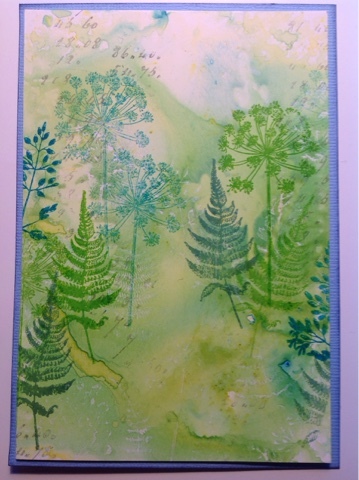 I stamped some ferns and grasses with a resist medium before adding the colour. They were barely visible, so I tried some stenciling with the CI ferns and grasses masks. They were barely visible too, so I stamped some more with green and teal inks. The front was kind of empty, and I decided to cover it with torn strips from kitchen paper that I had used while playing with the Brushos. The bunnies were stamped with memento ink on a marker pad and coloured with colour pencils + solvent. Plenty of fussy cutting, but I enjoy that, and thats why I often work with rather thin paper. I mounted them on thin foam tape and added some twirls of thread. The shrubs in the front are lazer cuts. The ferns are from Dutch Doobadoo and the flowers from Karen Marie Klip. Fantastic project Kristiina. Thank you for joining in the Crafty Individuals Challenge. I just love those bunnies. What a beautiful scene you have created for them. A great piece of art work. 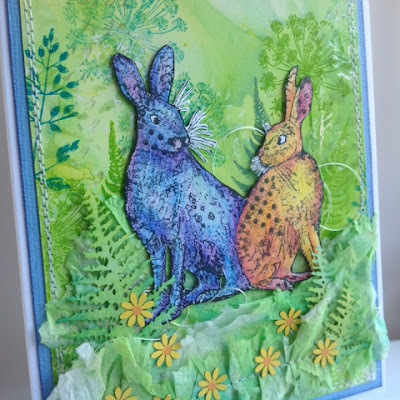 This definitely speaks of Springtime with those fabulous bunnies surrounded by the lush green of the landscape and pretty flowers. Thank you for entering this beautiful card into the Crafty Individuals challenge. 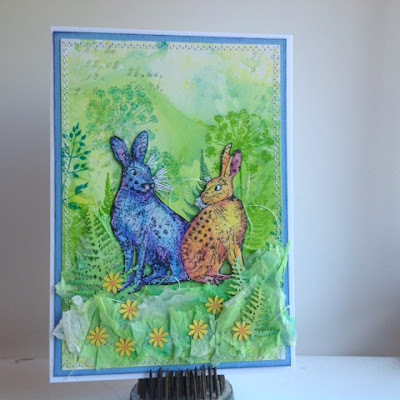 Thank you for joining in the Crafty Individuals challenge in May! Good luck. Wonderful! Love very much this delightful scene! Lovely piece of art!